The Unitarian Universalist Fellowship of Elkhart is a welcoming community encouraging religious freedom, nurturing individual spiritual and ethical growth, celebrating diversity, and promoting a just and sustainable world. 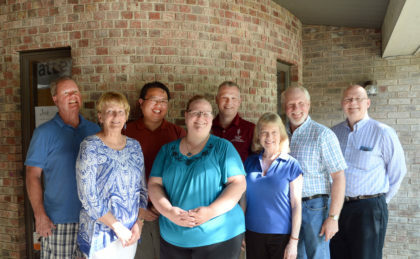 The Unitarian Universalist Fellowship of Elkhart’s board of trustees for 2017-18 are (from left) William Becker, Shari Mellin (secretary), Terry Mark, Lorna Lane, Chad Crabtree, Geneele Crump (president), Ken Clayborn (treasurer), and Chuck Bower (president-elect). The members of the Board of Trustees are elected at our annual congregational meeting in May. They meet at 6 p.m. on the second Wednesdays of each month. The meetings are open for all to attend. Chuck Bower, president, has been coming to UUFE since 1987. He has served and chaired many committees and enjoys the spirit of community in the fellowship. He is also a past president of the fellowship. Terry Mark, president-elect, is enjoying his ongoing spiritual journey as a theist who is open to the beliefs of other world religions. He is a past president of the fellowship. Ken Clayborn, treasurer, retired after 35 years at Miles/Bayer in various management positions. He and his wife, Joan, have been a members of UUFE for 13 years. He is a past president of the fellowship. Ron Gill, secretary, is the long-time editor of the weekly update email and a former board president. He succeeded William Becker, who resigned, on the board as of the January 10, 2018, meeting. Lorna Lane, at-large, is the current lead of our CUUPs (Covenant Unitarian Universalist Pagans) chapter, a member for 12 years, as well as a member if the Worship & Arts Committee and a teacher in our religious enrichment program.